This year we have been introduced to Ireland, known as the Emerald Isle, across the world because of it’s beautiful bountiful green countryside and precious historical monuments. 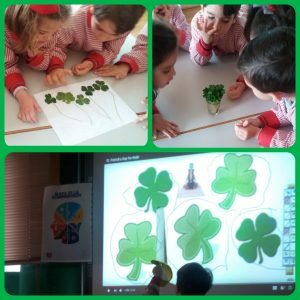 According to our “Vess” Phylosophy: Meaningful Life with Balance and Wisdom, before taking into account the celebration of St. Patrick’s Day, our children have explored the country where this tradition comes from. After inquiring about …Why is it such a green place…? 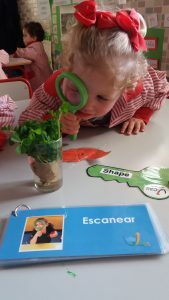 because of the trees, vegetables, frogs…? 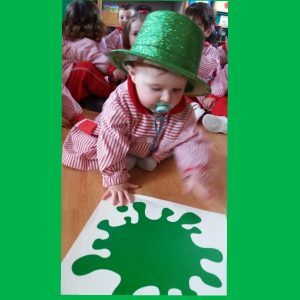 It is because of the SHAMROCKS!! 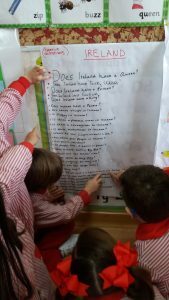 To begin, the children thought about and discussed what they wanted to know about this wonderful country, using “The Creative Questions” Routine. 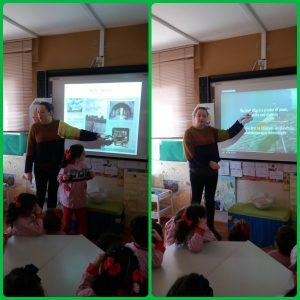 Our dear teacher Sarah, whose family comes from Ireland, has shared with us some curiosities related to the Irish culture, it’s monuments, ancient castles, the meaning of it’s flag, it’s language ,it’s traditional dance and musical intruments, and the story of it’s Patron Saint: Saint Patrick. One of the most special gifts that originates from Claddagh, a small place in Galway, is the Claddagh Ring. 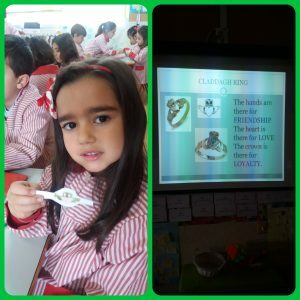 It is a jewel which consists of a pair of hands that represents Friendship, a heart for Love and a crown for Loyalty. Of course, you cannot buy this ring for yourself, but must be given one, for this is a gift of Love. 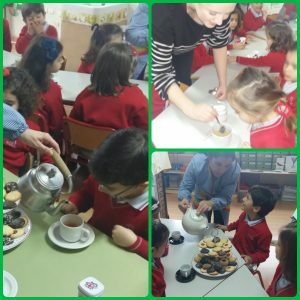 Continuing with learning about British customs, we have discovered and decided to put into practice the Mind Habit of Taking Risks, therefore we tried and tasted the traditional Afternoon Tea: A tea-related ritual which consists of a meal composed of scones, sweet pastries, cakes and a cup of delicious Tea!! Do you fancy a Cup? 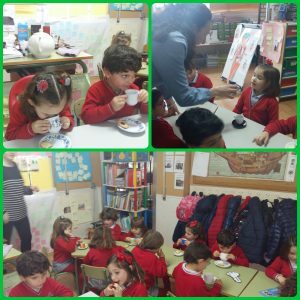 It’s Tea Time!! 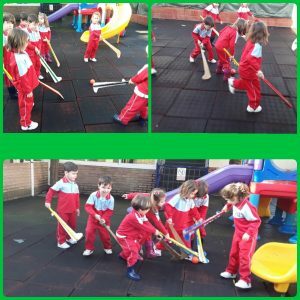 One of the most practiced sport in Ireland is “Hurling”, a popular Irish sport which children connected with some of the sports they already knew, such as football, golf and hockey. 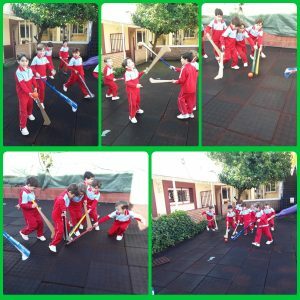 They also explored the rules of this game and the differences and similaraties with one of their favourite sports: Football. 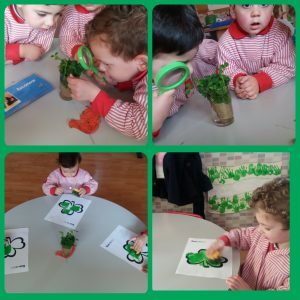 And being consistent with the Mind Habit: Reason with evidence, fortunately the weather gave us the chance to play it!!! 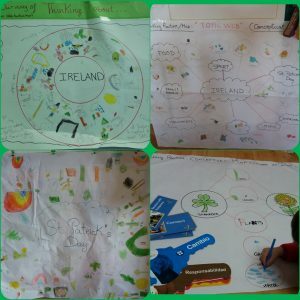 To conclude with this wonderful experience, we made our Conceptual Maps to reflect and document all we had learnt!! 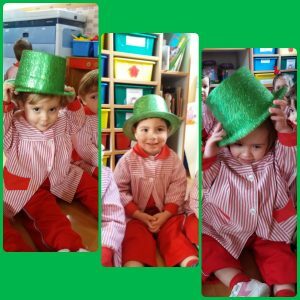 We assure you that our children have now become aware of the many quirks that make Ireland the enchanting place that it is.